The LaCie Rugged Triple Hard Disk provides universal connectivity: you've got the superior speeds of USB 3.0 and FireWire 800, and full backward compatibility with FireWire 400 and USB 2.0. You can transfer a 700 MB video file in less than 7 seconds with USB 3.0, compared to 25 seconds with USB 2.0 With the Rugged Triple's 7200 RPM model, you can even achieve speeds up to 110 MB/s. Whether your goal is super speed or complete compatibility, the Rugged Triple has everything you need. With the new LaCie Rugged, even if you take it into the field, your project stays on time. There’s no need to compromise on durability, mobility, and speed with IP 54-rated resistance to the elements and lightning-fast speeds through USB 3.0 and two FireWire 800 ports. Get blindingly-fast transfer speeds to your PC with backwards compatible USB 3.0 and FireWire 800 interfaces. Back up and transfer huge quantities of data in a fraction of the time. Luxuriate in obviously more responsive photo library browsing. The hard disk performs at up to 110 MB/s. 5400 RPM drives guarantee a minimum of 64MB of cache for premium performance and seek times. There’s no need to allow your project to be derailed by incompatibility between an external drive and computer. The LaCie Rugged connects to any standard computer, anywhere with both USB 3.0 and FireWire 800 interfaces. It’s ideally suited to your PC - since USB 3.0 is backwards compatible. 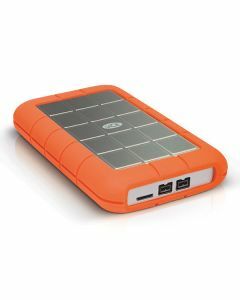 The LaCie Rugged is totally bus powered through its connecting cables. Its compactness and compatibility mean it’s the must-have sidekick to a new Mac or Ultrabook. Data isn’t interchangeable, so it’s vital to shield it from any conceivable mishap, whether that’s on the road or in the studio. That's why the LaCie Rugged is MIL-compliant - data is protected even during accidental drops of up to two meters (6.6 feet). The removable cover can also be deployed during transit to provide IP 54-level protection against dust and water. It’s sufficiently tough to be shipped for reliable delivery to clients or partners, and included software allows you to go one further and password protect your files with AES 256-bit encryption.